These fun little strawberry vegan marshmallows from Freedom Confectionary come all the way from England, and make the perfect snack or desset topper! 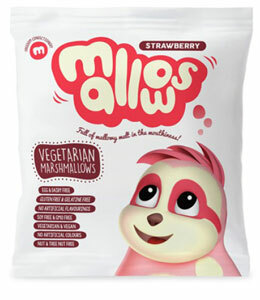 Free of animal ingredients, gluten, soy, tree nuts, GMOs, and artificial colors and flavors, these fluffy little clouds of strawberry goodness are perfect for snacking on, topping off desserts, and they work just as normal non-vegan marshmallows do in all your favorite recipes, too! 2.68 oz. (75g) package is $4.99.